As word gets out about our Video Game Parties, more folks are realizing the fundraising potential that EZPZ Video Game Parties provides to our Central Coast schools. As of this writing, two local schools are taking advantage of our commitment to our awesome community: Monterey Bay Christian School in Seaside, where we donated a 2-hour Mobile Game Party to their silent auction held in March, and Sacred Heart Parish School in Hollister, who will be providing a Mobile Game Party to the students who are the best walkathon participants next month! In both cases, we’ve also created promo codes for customers to use when booking their own parties. When the codes are used, we donate 10% of our proceeds back to the school (codes are MBCS and SHPS, respectively). If your school or non-profit is looking for fundraising ideas, give us a call! We’re happy to do festivals, after-prom parties, sober grad parties, and so on! We just need room for our truck and trailer (about 55 feet) on relatively level and stable ground. As a father of a middle schooler, I know it’s not easy having to help your kiddo sell all those candy bars, magazine subscriptions, Christmas decorations…the list seems endless. To do that on top of keeping up with homework, chores, the usual busyness of the week is a tall order for students and their parents! Let EZPZ help make it easier for your school community! Call or email us today, and we’ll explore the possibilities! 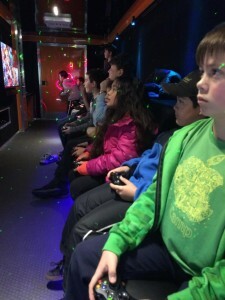 Kids, especially the ones celebrating their birthdays, are understandably excited when our Mobile Game Theater pulls up to their Central Coast home. A couple hours (or more) of button mashing with their friends and relatives (without parents limiting their playing time) is pretty much guaranteed fun. Note there’s no exclamation point. These kids said this not in a moment of exuberance and excitement, but what I perceived as a statement of fact. I find this to be quite humbling. It’s easy for those of us who own and run video game truck businesses to see every party as just another of hundreds of other events we work. We’re appreciative of each and every customer (well, MOST of us are…there are jerks in every cross-section of people and ours is no exception), but when a birthday kid makes what seems like a genuine statement like this, not only should I take notice, I have to take notice. Perhaps the birthday kid has had a rough go at it in their short time in this life. Pressure to keep grades up, bullying, family strife, peer pressure…who knows. As the dad of a 12-year old, I know my son is dealing with a lot and needs to blow off steam now and then. If I can alleviate some of that birthday kid’s pressure with a couple hours of fun with friends, then my business is more than just booking parties, marketing and bookkeeping. It’s a little bit of catharsis, an oasis in a dry land of science projects, chores and soccer practice. Not every kid is under such pressure, I realize. I’m not saying a game party is anything more than it is: a service I provide. However, if a birthday kid says something like it’s the best day of their life, then I’ll make doubly sure that they’re not disappointed. As mentioned elsewhere here on our site, the game truck industry is plagued by one or more affiliate marketing companies, based back east but using toll free numbers and wording on their websites that make it SOUND like their local (like San Francisco Game Trucks dot com), that attempt to book parties at 1.5 to 2 times greater than what most game truck companies charge, then attempt to book a local game truck at their usual rate…of course the marketing company keeps the difference. Often, the marketing company doesn’t find any game truck company who wants to work with them, so no party gets booked. The day of the birthday party comes, no game truck comes, and the poor parents are left scrambling, trying to find out what happened. This has happened dozens of times across the country, but thankfully it hasn’t happened here on the Central Coast (at least that we know of), despite the fact that these sites do sometimes show up when you Google terms like “Monterey Game Truck”. The good news is that our SEO (search engine optimization) efforts are paying off and these jokers are starting to get squeezed off the first page of Google. Now, usually when you use a search engine like Google to look for a local Mobile Game Theater (or game truck), you’ll see EZPZ and another game truck business up in San Jose at the top of the search results. The 3rd parties/affiliate marketers are starting to be relegated to the second page of Google results (most people won’t go past the first page). That being said, we can’t emphasize this enough: Please watch out for these 3rd parties. They go by names like Rush Cube, Mega Fun Game Trucks, and so on. To our Santa Cruz neighbors: you’ll probably see San Francisco Game Trucks dot com come up in your search engine results for Santa Cruz Game Trucks. They are an affiliate marketer. When in doubt, check and see if they have a local address and phone number. If you call them and sounds like you’ve reached a call center, you’re probably dealing with a 3rd party. Affiliate marketers aren’t all bad; most provide a valuable service to companies with whom they’ve established a relationship. The nefarious companies leeching off our industry (as well as others) often take the customer’s money first, THEN attempt to reach out to local companies. They have yet to attempt to contact us (though we usually don’t answer calls from toll-free or out-of-state numbers); we will not have anything to do with them. You can help us squeeze these companies off the first page of search engine results by clicking on our site (or other legitimate sites) when you Google “Salinas Game Truck” or “Santa Cruz Game Trailer”. Engaging with us on social media helps too! Lastly, if we’ve been fortunate to have you as a customer recently, please consider leaving a review for us! 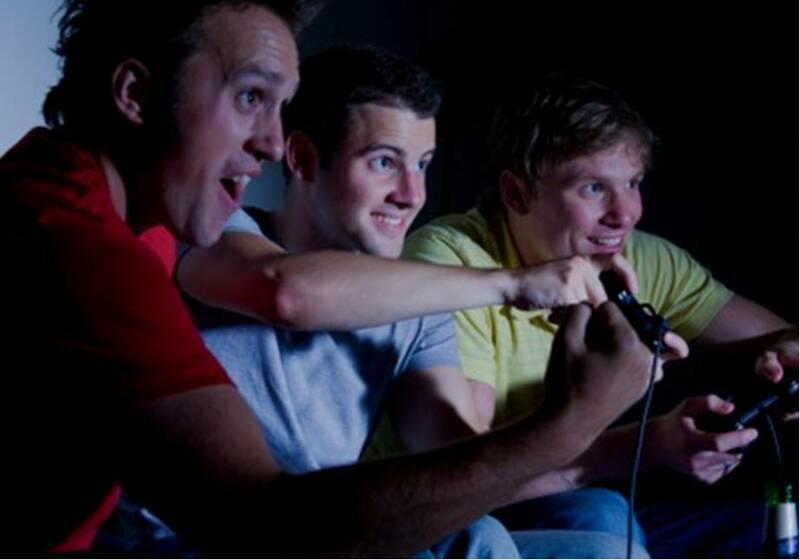 These actions may seem self-serving, but they send signals to Google, Bing, Yahoo, and other data aggregators that EZPZ Video Game Parties is a real local business. What IS a Video Game Truck, Anyway? Since EZPZ is pretty much the only “game” in town (pun completely intended), it follows that not a lot of people here in the 831 know about Mobile Game Theaters (MGT), or Game Trucks, or Game Trailers. Allow me to explain a little more in depth. In its most basic form, the MGT starts off as just a trailer…in fact, some people think I’m hauling an expensive car (not unlike the trailers you see in Pacific Grove, Carmel or Pebble Beach during Concours d’Elegance). Instead, the trailer is customized to contain stadium-style seating (comfortable, not those uncomfortable metal bleachers) and all of the accoutrements to house the gaming action. It’s hard to say when the current trend of video game trucks/MGTs began. One operation began in 2006 and is now a national franchisor. 10 years later, there are now MGTs throughout the US, Canada…even Nigeria! We’re proud to be one of the near-100 game truck owners who got their start from Dana and Ed Gainer of North Carolina, who not only design and build video game trailers, but still do parties and events with their MGT. The Gainers not only make a darn good MGT, they genuinely care about the businesses (and owners) they help launch. Regarding our Mobile Game Theater, it is 32 feet long and contains a total of 7 flatscreen televisions; 5 on the inside and 2 on the outside. The two outside are ideal for games that require movement, like dancing games or “instrument” games like Guitar Hero. One of the TVs inside is called the Action Station, which again can be used for motion-type games. The other 4 TVs are suited for multiplayer games like Halo, Super Smash Bros, Call of Duty Black Ops III, and Madden 16. The stadium-style seating is double tiered, so there’s plenty of room (24 is about the max inside, 4 outside). Each TV has its own Yamaha high definition sound bar; there’s never any complaint about not being able to hear the game. The trailer is kept fairly dark, though we keep an entertaining laser light show going throughout the trailer; between that, the TVs, and lighting above and below keeps the trailer safely illuminated. To see the trailer in action, please visit our Photos page as well as our Facebook, Instagram and YouTube pages. If you have any questions whatsoever, please contact us! PS: We now have a quick video showing what a mobile video game party is…click here to go to our YouTube page to see it! Resolving To Not Have New Year’s Resolution? Nah. Ask a group of people about their New Year’s resolutions. Undoubtedly some wag will answer “I resolve to not make any resolutions.” It’s as predictable as death and taxes. While I agree with the general notion that resolutions can be a way of setting oneself up for failure, there’s something to be said about careful goal setting and, well, resolve. Admittedly, I’m the worst at planning goals, much less following through with them…but I knew when I started the groundwork for starting EZPZ, I was going to have to break those old habits. Starting a business means good habits all around, including planning goals, schedules, marketing, and so on. I’ve had plenty of well-meaning folks tell me that this business will take off, that once word gets out I’d be making money hand over fist. Wonderful words, though these will ring hollow if I can’t plan well and follow through with them. To that end, I’m spending my first Saturday of 2016 pouring over event calendars in our Central Coast community, looking for appropriate happenings that can showcase EZPZ’s awesome video game truck! 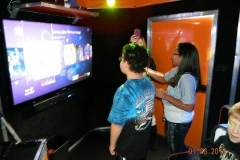 Don’t be surprised to see our Mobile Game Theater at local events, from festivals to 5k fun runs, from Big Sur to Santa Cruz; Monterey to Moss Landing! 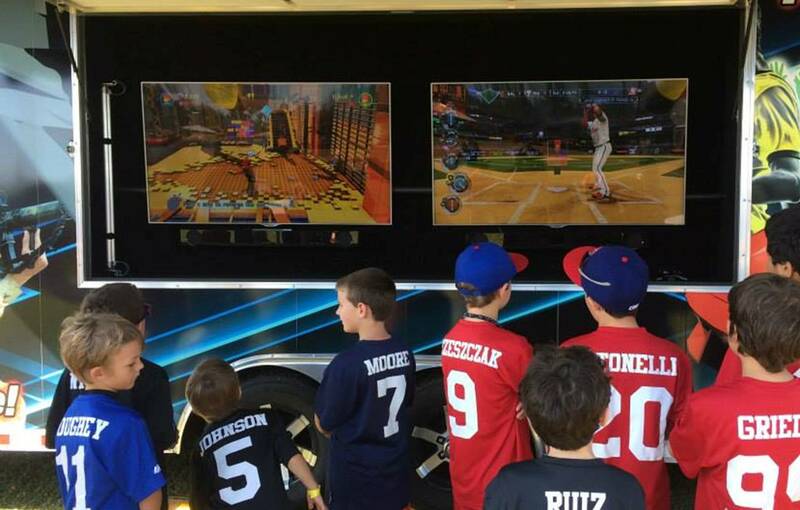 On that subject, if you’d like us to bring our “mega fun” game truck to your event, let us know before your date gets booked. Whether you’re one to make resolutions, or the person who makes a resolution to not make resolutions, let us all make goal setting part of our routine. Wishing all of our neighbors on the Monterey Peninsula, Salinas Valley, Santa Cruz and San Benito Counties nothing but health and success. As I was pulling into the last few of the 5,500+ miles of my trip from Marina to North Carolina and back with our new Mobile Game Theater, my GPS had me take a route I hadn’t used before. Instead of coming up 101 and getting off at the Monterey Peninsula exit, Google Maps had me get off in Chualar and get on River Road which, as you probably know, eventually connects to Reservation Road and gets you to Marina. What a treat it was! I caught a nice glimpse of Chualar, a town I never had been to before (other than passing through on 101), and after going past some farms, got treated to the Las Palmas neighborhood before going under Highway 68 and the home stretch to Marina. The weather was beautiful, so it was a nice (and new) way to come home. My family and I have lived in either Monterey, Seaside or Marina in our 10+ years here, so any time we can learn something new about the great area in which we live, it’s a good thing! Those of us who live along Highway 1 don’t tend to have the towns in the southern part of the Salinas Valley foremost in our thoughts, but each one has a unique identity. Soledad, King City, Greenfield and yes, Chualar are integral members of our Central Coast community! We look forward to serving these great communities along with those on the Monterey Peninsula as well as Salinas and southern Santa Cruz County. If you’re following us on our social media channels like Facebook, you probably know that we’re currently in the process of bringing our Mobile Game Theater from North Carolina to its new home on the Monterey Peninsula. While it’s been a long trip, it’s also been a rare chance to see parts of this great country that I probably wouldn’t have normally. I left the Central Coast Sunday afternoon, making it to Kingman, AZ after midnight. After stops in Albuquerque, NM, Van Buren, AR, and Knoxville, TN, I’ve arrived in Pinehurst, NC. The interesting thing is, the trip was never really that boring! Whether I was in the middle of a huge arroyo east of Winslow, AZ or dodging coyotes in the prairie near Oklahoma City, I was enjoying pretty much every new change of scenery. Mind you, I’ve traveled all over the U.S. (there are only 7 states I have yet to visit), but it’s almost always been by plane. There’s nothing like seeing the backwoods of Tennessee, the small towns along the famous Route 66. After some business-related activities here in Pinehurst, my college buddy Forest, who’s flying in to Raleigh on Saturday, and I will begin the long trek to bring EZPZ’s Video Game Truck back home to Marina, CA. 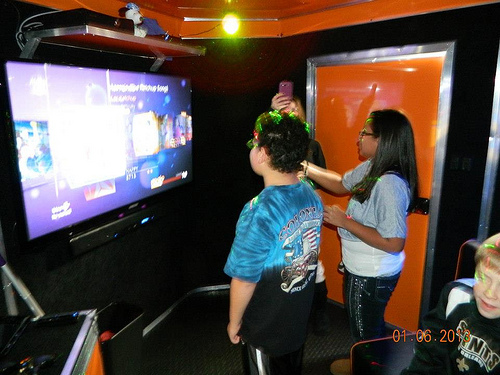 Once home, don’t be surprised if you see our Mobile Game Theater running around the area! Obviously we want to get the word out about this great option for birthday parties and fundraisers! So if you see us at Del Monte Center in Monterey or Northridge Mall in Salinas, don’t be shy…come up and say hi! We’ll have business cards and flyers to give you if you’re interested. Until then, please send prayers, good vibes, etc for our safe travel back to California! We’re officially open for business beginning Jan. 9, but don’t wait until then to book your party, our reservation system is up and running! See you soon! 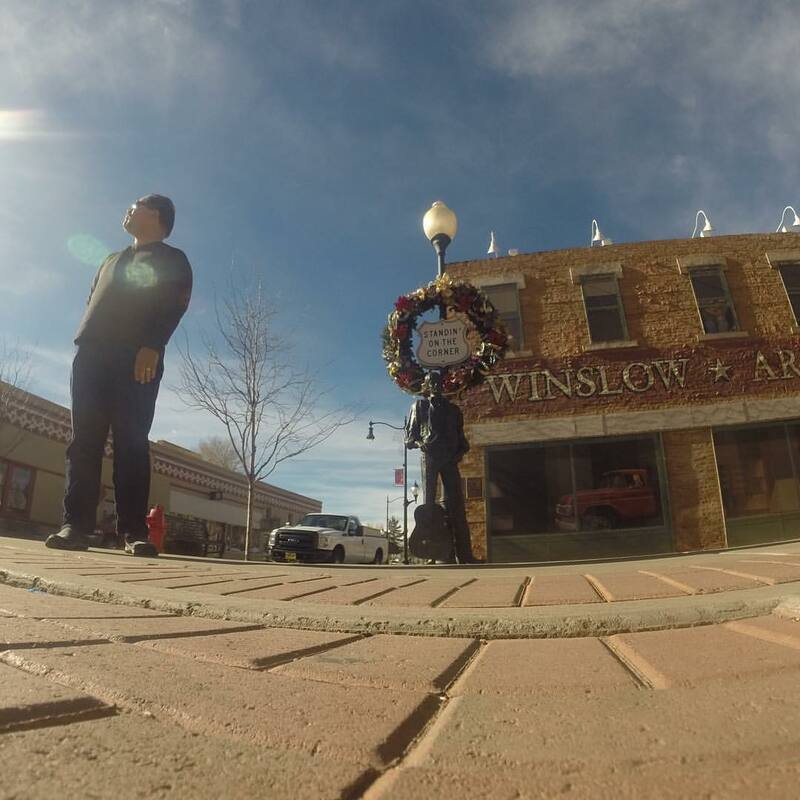 EZPZ’s Head Game Coach standing on a corner in Winslow, AZ. 2 Months Away From Grand Opening! As we head into mid-November here on the Central Coast, most folks are gearing up for the holidays: planning the menu for Thanksgiving, figuring out whose holiday party to go to on which weekend, Hanukkah, Christmas, New Year’s. Needless to say, it’s hectic and downright crazy! For us here at EZPZ, we’re counting the days. Not shopping days until Christmas…until we open the doors of our Mobile Game Theater for the first time on the Monterey Peninsula! We’ll be having our first event in Marina on January 9th. Our trailer is just about ready; the nice folks putting it together in North Carolina are dotting the i’s and crossing the t’s, making sure each Xbox, PlayStation and Wii (and their controllers, of course) are ready to go for our first party! After Thanksgiving, EZPZ’s team will travel to the Tar Heel State and bring back our awesome video game truck back to California. We’ll be well-accustomed to the best that Interstate Highway 40 has to offer! We’ll be posting our travel exploits on our Instagram, Twitter and Facebook accounts. You needn’t wait for our Mobile Game Theater to arrive in order to reserve your party in 2016! Our reservation system is LIVE and ready to accept your booking! Visit our booking page now to save the day and time for your birthday party, school fundraiser, team building event, etc. before someone else beats you to it! If your kid is past the age of jump houses and has been to more parties at Monterey Lanes or Chuck E Cheese than s/he can count, think of EZPZ Video Game Parties in 2016! Looking forward to our first party on January 9th! You may have seen websites here on the Central Coast (specifically Monterey and Santa Cruz) advertising video game truck parties. They make it sound like they are local, but in fact is a marketing company back east. When you call, they “book” your party for 1.5 to 2 times the price, happily take your money, then call a REAL local video game truck company and try to book your date. If they can’t find someone to take the job, they pretty much don’t do anything and allow your event to be ruined because of their greed. Then you’re tasked with trying to get your money back. Expect delays and unreturned messages until you make enough noise. They seem to respond to at least some folks who complain to the Better Business Bureau, but it seems like a lot of folks just give up. Video game trucks aren’t their only area of expertise: helicopter tours, hot air balloon rides, skydiving…they manage to ruin the fun of some pretty cool activities. The most telling signs that you’re dealing with a marketing company like this are: they use a toll-free number, and there’s no sign of a local address anywhere on their site. Some legitimate game truck companies use 800 numbers (or similar), but most do not. Whether or not you hire EZPZ for your upcoming event or you hire another company, please make sure you’re hiring us directly! Call us…you’ll know we’re local! We’re based in Marina; we’ve lived in either Monterey, Seaside or Marina for the past 10+ years. And if, by chance, the marketing company in question is reading this and taking umbrage to this post: we’ll be glad to direct everyone’s attention to both the BBB complaints page you’ve helped create, the Yelp page of one of your several business “aliases”, as well as the phone number and email of the state investigator who’s currently looking into your shady business practices. We can not and will not honor bookings made through 3rd parties like Rush Cube, San Francisco Game Trucks dot com, Mega Fun Game Trucks dot com, and similar entities. If you’ve booked through them already, all we can do is forward you the contact information of the state investigator mentioned above. And share in your frustration that such underhanded people exist. Please don’t let your upcoming event be spoiled by dishonest companies…book us direct by visiting our bookings page! We look forward to a great time! Welcome to the website and blog of EZPZ Video Game Parties, the newest (and most fun, in our opinion) option for your next birthday party or just about any other fun event. 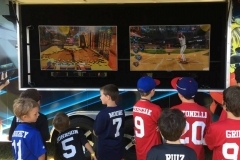 Simply put, EZPZ provides a 32 foot Mobile Game Theater to your location. Our Mobile Game Theater, or MGT for short, is fully stocked with great multiplayer games on several different platforms like Xbox One, Xbox 360, PlayStation 3, PlayStation 4, and Wii U. Enjoy our stadium-style seating and laser light show while gaming on one of our five high-definition flatscreen TVs…and that’s just on the inside! We have 2 more TVs on the outside, ready for your motion-based gaming desires like Just Dance. 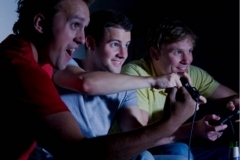 Our MGT can accommodate up to 25 of the gamers in your life! Our MGT is self-powered, so we can bring it to any outdoor spot that has 55 feet of space (includes our truck). We can do indoor events too, we just need access to electricity as we can’t run our generator indoors. Not sure if you have 55 feet of room in front of your house? You’re in good company! Many of the homes here on the Monterey Peninsula and Santa Cruz areas are short on curb space…good thing there are many options! Have your party at a park, your church, community center…we’re also working on partnering with some pizza places so your food and entertainment needs are all taken care of. Do you know of schools, churches, or non-profits that need help raising funds? We can be of assistance. Our MGT is available for booking at a highly discounted rate! Contact us for details soon. Are you part of our great military community here in Monterey? Defense Language Institute (DLI) student? Hard at work at the Naval Postgraduate School (NPS)? We give a 10% discount to active military! Email us for our promo code. Booking our MGT is a cinch. Simply go to our booking page, find the available time and day that works for you, submit your payment, and you’re done! We’ll touch bases with you before your event, but by all means, please feel free to contact us in the meantime. Didn’t get your question answered here? Our FAQ page is chock-filled with more information, or just contact us. Call us at (831) 275-1198 or email us at sales@ezpzvideogameparty.com. We’re still getting our ducks in a row, and will be accepting bookings beginning January of 2016. Please take a look at our photos and videos of our Mobile Game Theater in the meantime! We can’t wait to start livening up your parties here on the Central Coast!